The McIntosh Presbyterian Church was built in 1907. The church was organized on April 26, 1885 and was originally known as the Center Point Church, having been located just north of McIntosh. There is still a cemetery located at that site. Dr. Henry Clay Walkup was the inspiration to locate a Presbyterian church in McIntosh and donated the land where the church now stands. ​Dr. Walkup was related to William Henry Belk of the Belk Department store chain, who lived in Charlotte, NC. Mr. Belk was a frequent winter visitor and lent his financial aid in building the church at a cost of about $3,000, according to church records. The building is built of heart pine with some heart cypress. Unfortunately, Dr. Walkup passed away just prior to the official dedication of the newly-built church building. 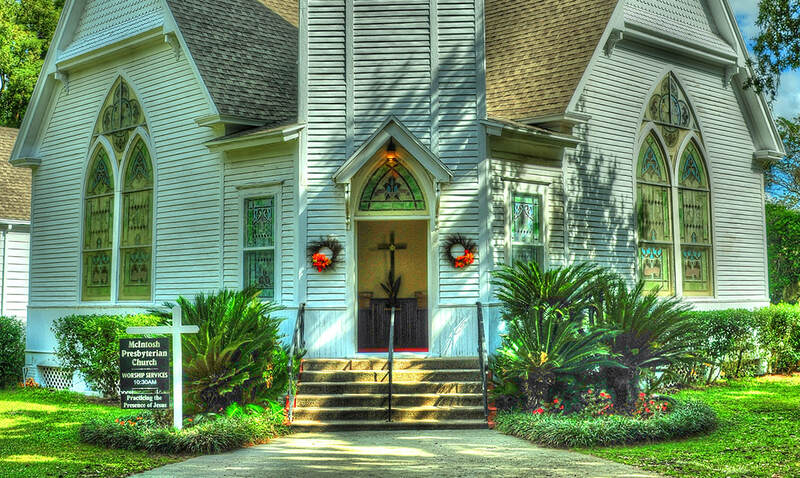 The church name was changed to McIntosh Presbyterian Church on November 11, 1908. This church, with its two rectilinear wings joined on a 45 degree angle, spindle work, and tower is built in the late American Victorian style. The sanctuary was graced with the benefices of the William R. Brown family. The interior of the sanctuary is distinguished by the lovely art stained glass windows. The oak pulpit furniture is of the East Lake Period, the carving of the pew arms is reminiscent of churches built at this time. The woodwork in the ceiling and the chandeliers are also points of interest. At the back of the sanctuary, hanging on the wall is the McIntosh plaid. In 1943, again with the financial aid of Mr. Belk and W. R. Brown, a pastor’s study, Sunday school room, fellowship hall, kitchen, and lavatories were added.